For all of us cloth diaperers, we probably all know The Willow Store best for their unique, reversable Sprout Change diapers! However, the Willow Store is about much more than just cloth diapering; in fact, owner Catherine Bolden, a mom and entrepreneur, started her business as WillowPads back in 2005, wanting to bring high quality, environmentally friendly reusable feminine hygeine products to the market. From there, WillowPads expanded into WillowSprouts and EverydayWillow, bringing the same type of top quality, US-made products into the baby and household markets as well. Now, the Willow Store exists as an amalgomation of all of these brands, still proud to carry all American-made products that are good for your family's health as well as for the earth. Nowadays at The Willow Store, you can find everything from Sprout Change diapers, to a variety of sleep pillows and textiles, to organic feminine pads, a full postpartum kit, wet bags, children's toys, and more. Up for review, Catherine of The Willow Store sent me a set of 3 gorgeous wool dryer balls to review. 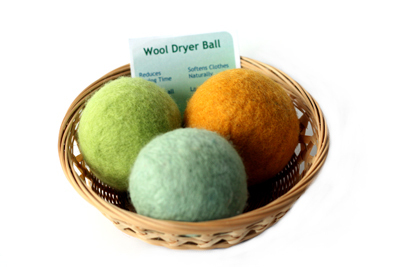 Wool dryer balls are perfect for anyone who is cloth diapering or who is concerned about the environment. Though your normal dryer sheets might smell great and leave your clothes feeling soft, it's only because they are laden with horrible residues and chemicals that you can enjoy these types of perks. Aside from being bad for your family's health, dryer sheets leave a buildup on your laundry and in your dryer itself. This waxy buildup can render your cloth diapers ineffective, preventing them from absorbing and doing their job. Besides that, many dryer sheets can also cause irritation on babies' sensitive skin. From day one of cloth diapering (and of having a newborn), I gave up the dryer sheets. For a while I used nothing but vinegar as a fabric softener in their stead. After a while, though, the static (especially in the winter), began to get to me. So, I created a set of wool dryer balls for myself by winding some 100% pure wool yarn into balls, then felting them down so they'd be more effective. They are effective, but they sure are noisy! Slightly larger than tennis balls (and definitely heavier), my homemade wool dryer balls leave my husband cringing with late-night laundry loads. I was very excited to try the wool dryer balls from The Willow Store to see how they differed from my own project. I received the set of three balls (retail value $19.95) packaged very nicely in a cute little basket. I love the gorgeous colors and should note that they are always changing up their colors with whatever variety of colorfast wool is available. Though vibrant, these wool balls are safe to use even with your diapers or loads of whites as they will not bleed. The website says the dryer balls are approximately 9" in circumference, or about the size of a standard tennis ball. Although I'm sure some variation is to be expected, the one surprising point I found with my dryer balls is that they were all about 7"-7.5" inches in circumference. Having made my own, I understand that probably they did start out larger but likely shrunk during the felting process (felting is when wool shrinks and mats down). Personally I would prefer that the balls were a little bigger, just so they get even more surface area into pounding that laundry dry, but nevertheless, they still did the trick! - Wool dryer balls will speed up the drying of your laundry loads, thus reducing your bills and energy consumption. The more balls you use in the dryer, the faster your laundry will dry. - These Willow Store wool dryer balls are made in the USA! I would highly recommend these gorgeous dryer balls to anyone out there at all, whether you cloth diaper or not! They are good for your health, your wallet, and the environment, and they are totally effortless. Just leave them in your dryer for years--nothing to add or throw away before or after drying loads of laundry! I really think wool dryer balls are one of the best kept secrets out there and would also make a great gift for almost anyone! BUY IT: Visit the Willow Store to pick out your very own set of 3 wool dryer balls for just $19.95!